Legal assistants provide a variety of services to support attorneys with every phase of the research and preparation for a case. This can include document preparation, records management, reviewing evidentiary filings, proofreading briefs, and a variety of other tasks that assist the attorney of record. Resume objectives are used to demonstrate your fit with an employer, so the legal assistant position’s objective should focus on those skills and traits that will make you most effective in a support position. Knowledge and diligence are key with this profession, but communication skills are also important. 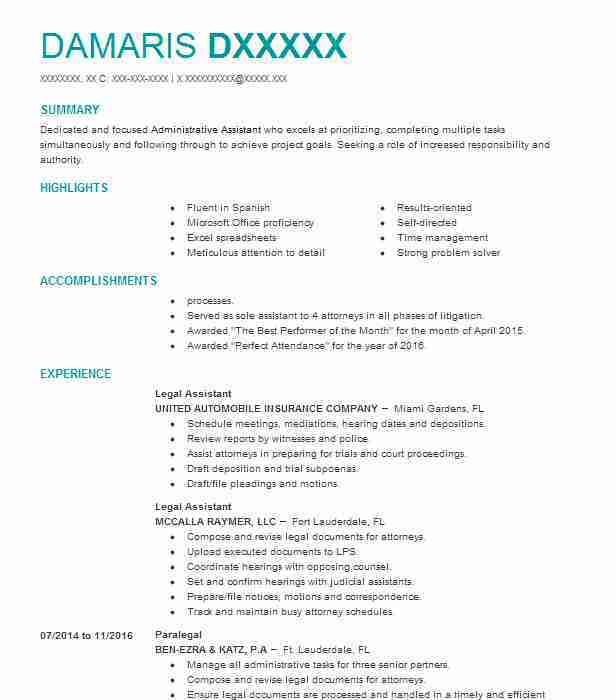 Getting the most out of your resume involves crafting an objective that both demonstrates these skills and also directs your reader to the relevant portions of your resume as a whole, like experience or education. When polishing, keep it focused and concise while delivering on those items by being direct, to avoid confusion. Remember to write an objective that clearly speaks to the level of employment you are seeking, by reflecting on your own experiences. Seeking a legal assistant position in litigation that will engage previous research experience and training in the library sciences as an organizational tool for the benefit of the firm. Detail oriented candidate seeks entry-level legal assistant work with a firm specializing in tax law, to combine her previous work experience and recent education toward a single professional specialty. 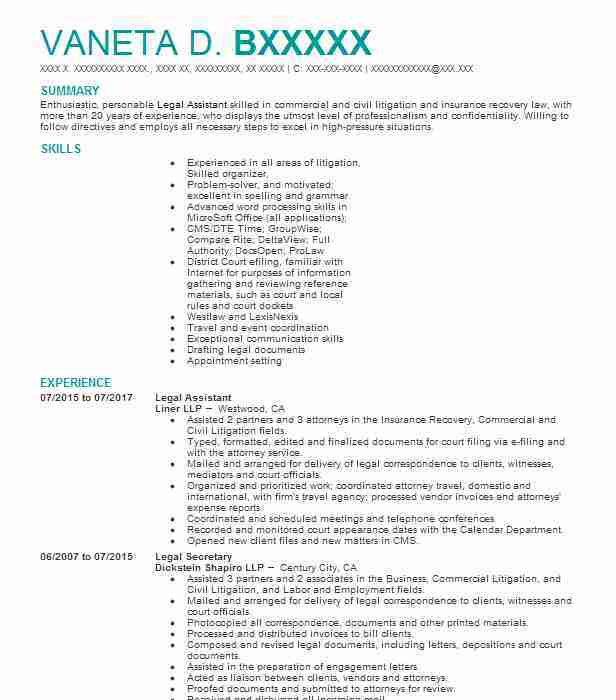 Looking for an internship in legal assisting to supplement coursework in legal studies and provide an opportunity to put recently earned professional skills to use in real-world scenarios for the benefit of attorneys and clients. Senior legal assistant with eight years’ experience seeks a position with an efficient partnership in need of organizational support skills polished with experience with estate and tax law firms. 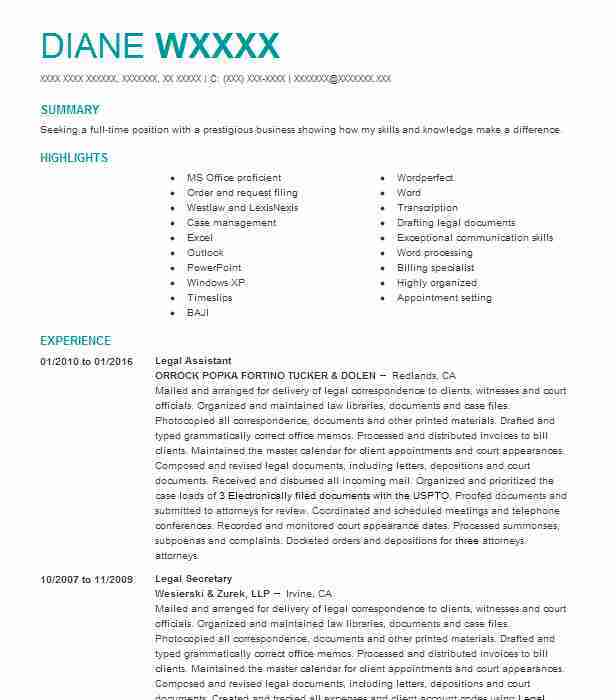 Searching for a legal assistant position with a local firm serving the community through a diverse combination of legal services. With its prominent location just below your contact details, a resume objective is a great place to combine as much information as possible into one place. This includes mentioning one or more hard and soft skills so employers get an idea of who you are as quickly as possible. 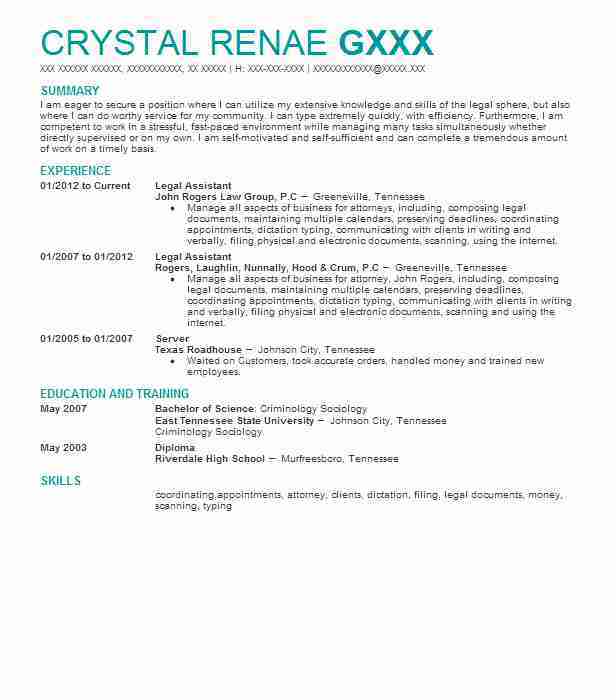 When you write your resume for a legal assistant position, you need to show that you have the knowledge necessary to perform administrative legal tasks. Each job description is different, so look closely for required skills and include the ones that apply to you. While your goal is to present yourself in the best possible light, do not include skills you do not have. 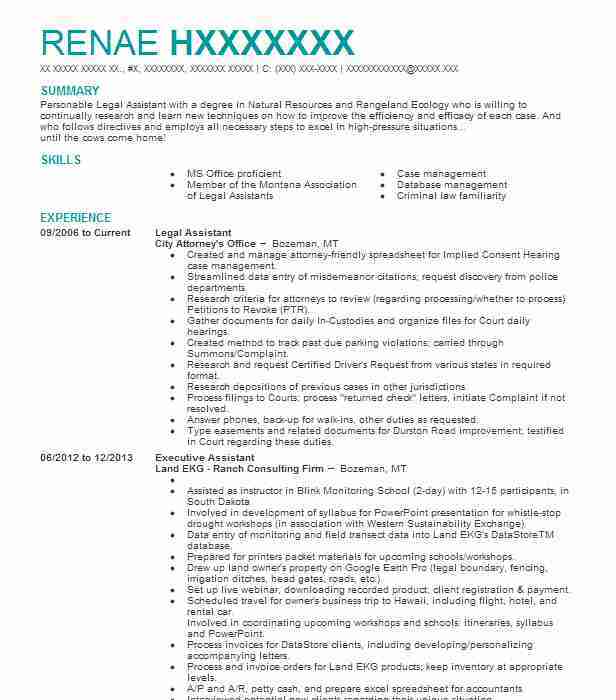 Summary: Seeking a full-time position with a prestigious business showing how my skills and knowledge make a difference.